The UK printing industry continues to defy its own forecasts as both output and orders displayed positive growth, above the expectations for Q1 – unfortunately the Q2 forecasts reveal that concerns remain. The latest Printing Outlook survey shows 43% of printers increased output levels in the first quarter of 2018. A further 37% held output steady whilst 20% experienced a decline in output. The resulting balance (the difference between the ups and the downs) was +23; up on the forecast of +12 for Q1 and greater than the +19 recorded in Q4. Whilst the Q4 period was notable for the absence of a seasonal boost, it seems that some of that trade may have carried into the first quarter. This is the first time for seven years that Q1 output has outperformed Q4. 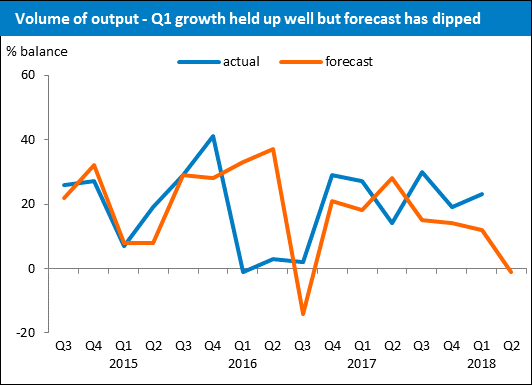 Furthermore, the current Q1 output balance is slightly greater than the trend line for growth over the last four years (which sits at a flat 20% balance over the entire period). Recent forecasts have turned out to be on the pessimistic side, Q1’s above-trend performance has done nothing to dispel the pessimism. In fact, the expectations for Q2 have now fallen into negative territory, and to a level that has not been experienced since Q1 2016. 29% of respondents predict that they will increase output levels in Q2, a further 41% expect output levels to hold steady. However, 30% forecast that output will fall in Q2. The forecasted balance of -1 would, if realised, be a significant downturn from Q1. The output balance of +23 was above the forecast of +12 for Q1. A balance of -1 is forecast for the coming three months. Confidence in the general state of trade in the printing industry flatlined in Q1 – whilst it remained marginally above the negative forecast, the expectations for Q2 show that confidence has eroded further. It seems the industry is expecting a tough trading period in Q2, and an intensifying battle to maintain output and minimise cost pressures. On this occasion the Q2 period may well be characterised by supply-chain cost and delivery concerns, wage pressures coming through and new legislative costs and burdens coming into force. 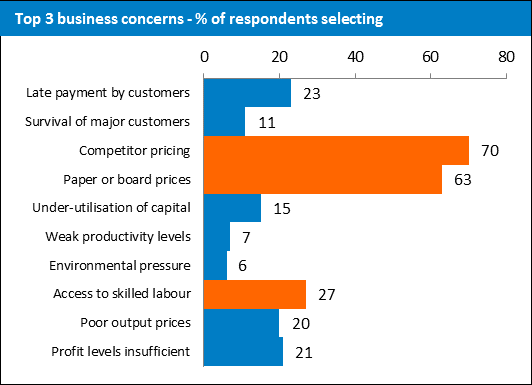 Competitors’ pricing below cost continues to be the most voiced business concern – the proportion selecting it this quarter is unchanged from last quarter; it remains at 70% (it was 65%, 70% and 81% in the preceding quarters). Paper and board price concerns remains the second ranked concern; this was selected by 63% of respondents, up from 60% last quarter (and 47%, 42% and 32% in the quarters prior to that). Access to skilled labour remains the third ranked concern, with 27% of respondents selecting it (down from 32% previously). Access to skilled labour remains above late payment by customers which has returned as the fourth-ranked business concern. We have been collaborating with Begbies Traynor to develop further relevant industry and sector analyses; some of which we are introducing in the latest Printing Outlook report. 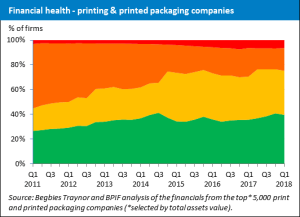 We have now compiled a detailed financial health analysis of data for the 5,000 largest print and printed packaging companies (as selected by total asset value ranking). The financials for each company have been rated and updated over time – analysis of this will provide some interesting insights and benchmarks. Looking at the financial health chart, and working from the bottom up – the green proportion shows the share of the top 5,000 companies that are in a strong and secure financial position. The yellow section shows the proportion of companies with a less strong financial position, representing an average credit risk. The orange shading depicts the share of the top 5,000 companies that are considered to be a higher credit risk due to their financial results, past trading history, the lack of available information or the presence of detrimental information against them. Finally, the red section is for high risk companies with poor credit scores and/or serious detrimental information filed against them and companies that have undergone insolvency or have a striking-off action registered against them. The BPIF Printing Outlook Q2 2018 report goes into further detail. 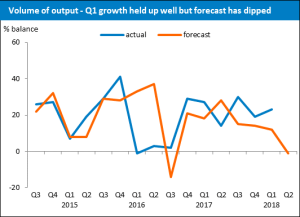 The UK printing industry continues to defy its own forecasts as both output and orders displayed positive growth, above the expectations for Q1 – unfortunately the Q2 forecasts reveal that concerns remain. Confidence in the general state of trade in the printing industry flatlined in Q1 – whilst it remained marginally above the negative forecast, the expectations for Q2 show that confidence has eroded further. Competitors’ pricing below cost continues to be the most voiced business concern – the proportion selecting it this quarter is unchanged from last quarter; it remains at 70%. As Brexit progresses the UK printing industry continues to voice a diverse range of opinions and emotions – overall confidence has continued to become slightly less negative. Capacity utilisation exhibited a welcomed pick-up in April in comparison to January, despite the Easter period falling amidst the survey period. Recruitment growth slowed in Q1 and ducked below the forecast, but it does remain positive. Average prices in Q1 have continued to reside well below recent forecasted levels – as a result the expectation for Q2 has dropped in comparison to the recent forecasts. All cost areas have continued to be under significant upward pressure in Q1 – paper and board increases grab the headlines once more. The relentless pressure on margins is showing no signs of abating. Printers have reported a more pressurised profit distribution in April, with more in the red zone in comparison to January. Export orders exceeded 5% of turnover for 22% of respondents; for these companies export order growth was surprisingly only marginally positive, on balance, in Q1. Exactly one-quarter (25%) of respondents reported that they had conducted a pay review in Q1 – 51% expect to do so in Q2. UK consumption of printing papers and boards fell overall in 2017, though packaging cartonboard experienced some growth. The BPIF’s Brexit and Post-Brexit Barometers. Costs – paper & board, ink, labour and energy. Pay Reviews – activity and average % changes. Data on capacity, productivity, margins, and more. Consumables – paper consumption and printing ink data. Tickets for the Annual Luncheon cost £99.50 per person. To book tickets, please email lucy@theprintingcharity.org.uk or call 01293 649 367. The British Printing Industries Federation (BPIF), Oxford Brookes University, The Publishers Association, The Bookseller and The BookMachine are calling for entries to the British Book Design and Production Awards 2018. These are the only industry awards to promote and celebrate the excellence and craftsmanship of the British book design and production industry. The deadline for entries is Friday 29 June 2018. The awards will be presented at a dazzling ceremony on 22 November 2018 at the Montcalm London Marble Arch Hotel. For further details on the awards please go to www.britishbookawards.org or contact Heena Bulsara at the BPIF on 020 7915 8338 or heena.bulsara@bpif.org.uk.